A number of juveniles in a stolen van led authorities on a pursuit in Morgan Hill Sunday before crashing into a fire hydrant and light pole, according to police. Kris Sanchez reports. 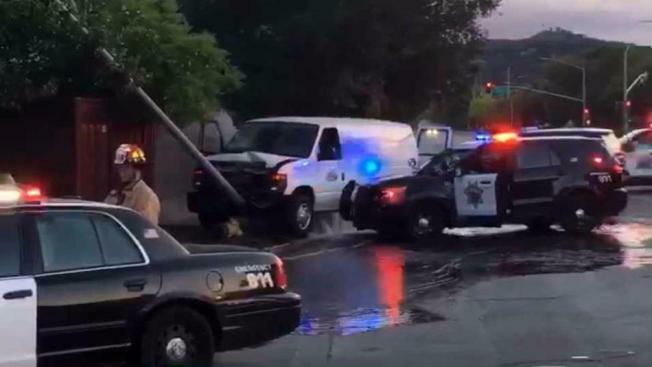 A number of juveniles in a stolen van led authorities on a pursuit in Morgan Hill Sunday before crashing into a fire hydrant and light pole, according to police. Three of the juveniles involved were transported to the hospital, police said. The extent of their injuries was not immediately known, but officers do not believe that the injuries were serious. During the chase, a male juvenile behind the wheel eventually started driving toward officers but ended up crashing, police said. Police say the male juvenile stole the car from Live Oak High School and drove away with three female juveniles in the passenger seats. Officers at first thought that the girls inside the van may have been in the vehicle against their will, but that speculation was eventually determined to not be the case. One of the girls inside the van was eventually dropped off at home, according to police. She told her parents that she was afraid because of the male juvenile's erratic driving, prompting them to call police. An officer eventually spotted the stolen vehicle and attempted to pull it over, but the driver refused to stop, according to police. When police tried to later stop the van by hitting it and causing it to spin out, the vehicle turned roughly 180 degrees, police said. That's when police say the driver drove in the direction of officers and crashed into the fire hydrant and light pole. After being released from the hospital, the male driver is expected to be arrested on felony charges including evading arrest and child endangerment, according to police.